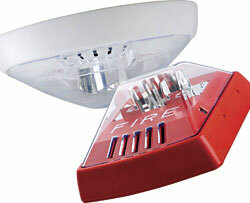 The Wheelock Exceder line of notification appliances includes strobes, horns and horn strobes with a sleek, modern design. The line has the industryâ€™s lowest current draw, according to the company. All strobe models feature eight candela settings on a single appliance. Features multiple mounting options and a combination of 12 and 24 VDC in one appliance for use in different installation requirements.